The variety in Puerto Rico surprised us. We started off in Old San Juan with its pink buildings, steep and narrow blue-cobblestoned roads, and historic elegance. We drove from there to our dream destination: El Yunque Caribbean National Forest, which didn't disappoint. We spent a couple of days in the luscious rainforest that was teeming with tropical birds, lizards, coqui frogs, tree ferns, and other delectables. We loved every second. See our pics and read about our stay there in this post. Then the 5 of us crammed once again into our rental Nissan Altima, and ambled very carefully over the mountain roads toward the southeast coast. Our immediate goal was to find a beach where we could swim. Our ultimate plan was to cover the whole island more or less in just a few days. As we made our way to the coast in search of a beach, Ken said about the very cramped drive, "This is fun, but could quickly become torture." We tried to divert attention from aching butts and precipitous roadside cliffs by singing loudly along with Sadie's Ipod - amusing songs like "Timber" by Sons of the San Joaquin. Which is actually a good cowboy song, but grows ludicrous as it's played over and over. Soon we arrived at Punta Tuna Lighthouse on the s.e. coast, which had a beautiful beach. But swimming was not allowed. We left the disappointing Punta Tuna and moved on in our quest for a place to swim on the s.e.coast, stopping to check out Playa Lucia, near Yabucoa. It was exactly what we wanted. Behind the wide sandy beach, all the trees were coconut trees. 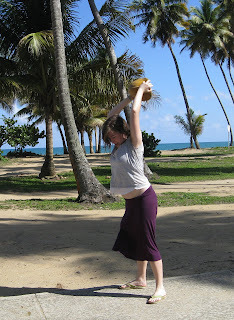 Coconuts were falling from the trees - we had to try to open one. 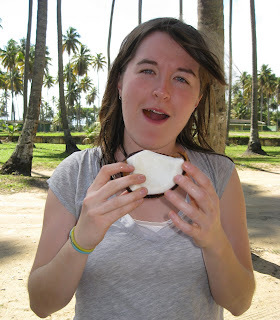 Sadie persistently threw a whole coconut against the sidewalk. Alan went after another one with a knife, then slammed the inner part against the pavement. Meanwhile, the sea and the waves beckoned, and so we plunged into the aqua blue ocean of Playa Lucia. We were surprised to find several living sand dollars in the shallow surf. I've never seen a live sand dollar in the U.S. These creatures are echinoderms, related to sea stars and sea urchins. The ones you find in beach-novelty stores are just the skeletons of dead ones. [See this piece Alan wrote about shops in the U.S. that sell over-harvested sea animals as "cute" knick-knacks.] The photo above is the underside of a living sand dollar we found, showing the hundreds of little moving spines that they use to either burrow or creep along the ocean floor. We put it back where we found it promptly of course, so as not to injure it. 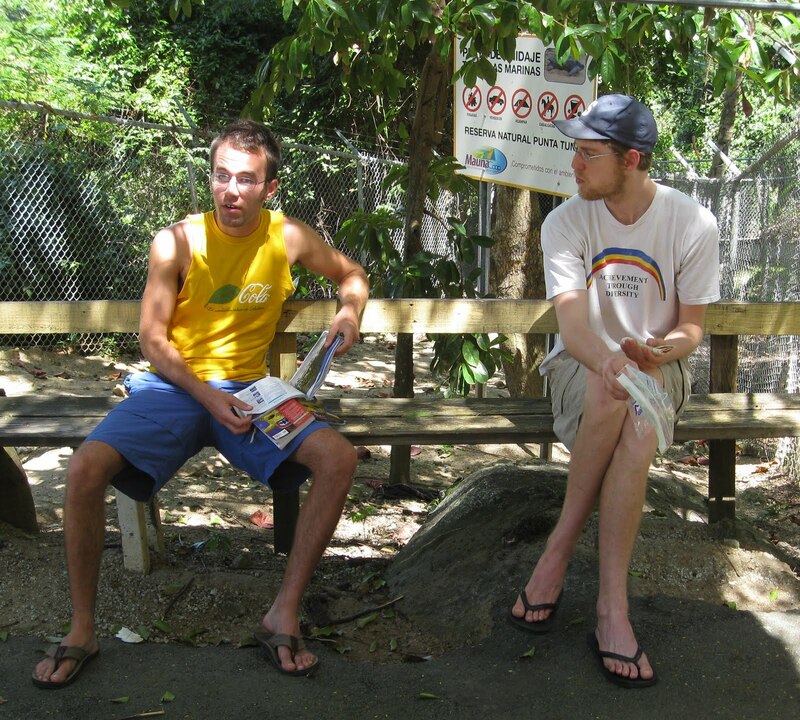 After our beach-craving was satisfied, we were ready to head off to Jayuya, a town in the Cordillera Central that Alan had selected. The area has some of the island's highest peaks and an interesting history. Jayuya is rich in Taino culture, the indigenous group of people who ruled the island when Christopher Columbus arrived. It was also the site of the "Jayuya Uprising," a 1950 revolt against the U.S. government by Puerto Rico's Nationalist Party. During the uprising, the U.S. declared martial law in Puerto Rico, and attacked the town of Jayuya with U.S. bomber planes and artillery. Part of the town was destroyed, although news of the action was kept out of the U.S. media somehow. Alan's been living in Puerto Rico for several months and had heard that many of the people of Jayuya are still a bit hostile toward the U.S. We were curious. So off we went. See my next post. We visited our son Alan in Puerto Rico in March. He's working there temporarily, collecting data on the island's bird populations for a project based at NC State. I wrote on April 5 more about Alan's job. 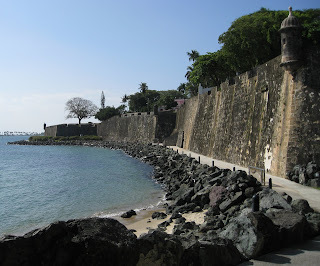 I also wrote about the day we spent in historic Old San Juan, with its steep cobblestone streets, old Spanish forts, and occasional interesting critters. After seeing Old San Juan, we blasted eagerly on to El Yunque Caribbean National Forest, the crown jewel of Puerto Rico's remaining wild areas. El Yunque is perched high in the mountains of the island's interior, the only tropical forest in the U.S. National Forest system. Almost half of El Yunque's 28,000 acres are still virgin forest, and virgin forests are rare anywhere these days. Puerto Rico used to be completely forested, before Columbus set foot there in 1493. But, with agriculture, the timber industry, and development, the forests are mostly gone. Puerto Rico is a relatively small island - only 110 miles E to W; 40 miles N to S. So El Junque is only an hour or so from San Juan. It could be an even faster trip, but the roads in the mountains are narrow and curvy. We stayed in the only lodging we could find that is actually in El Yunque, which was Casa Cubuy Ecolodge. It was a bit expensive, but we were only there two nights. All 5 of us stayed in one room, to economize. Above, my family: Sadie, Ken, Alan, and Matt (photo by Sally Kneidel). 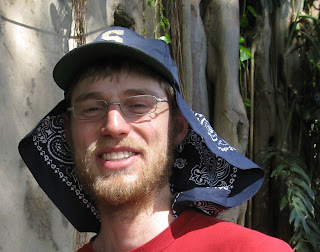 Matt's creative headgear kept bugs and sun off. Mosquitos love Matt, but their affection for him is unrequited. We saw lots of tree ferns, which really are ferns that are tall trees. El Yunque has 240 species of trees, 23 of which are endemic to El Yunque. This forest also has 150 species of ferns and 50 types of wild orchids, I've read. We saw flowers everywhere, many of them familiar species that decorate yards in the States - like impatiens, which grows wild in El Yunque as a native plant. 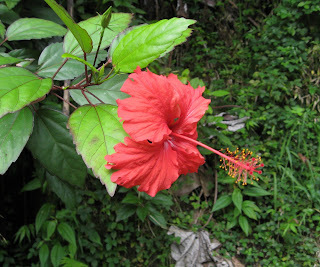 Bromiliads, Heliconia, and Hibiscus flowers are common tropical flowers in El Yunque too. We heard the lovely chirping of the coquí frogs constantly, whether inside or out, with their cricket-like "ko-KEE, ko-KEE". According to the US Forest Service website, "Coquí frogs are plentiful and considered a national treasure in the forest. There are currently 13 species of coquís. 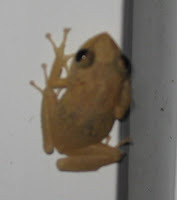 These tree frogs are endemic in Puerto Rico." Still, as common as they are, they're hard to spot. Below is the only picture I took of one, and it is, admittedly, pretty bad. I've read that bats are the only remaining native mammals in Puerto Rico. We didn't see any bats though. Didn't see any mammals at all except a lot of feral cats and dogs and an introduced mongoose - but not in El Yunque. Mongooses were introduced to control rats (which were also introduced). The mongooses have wrought havoc on wildlife in some areas, but have had no effect on the rats. 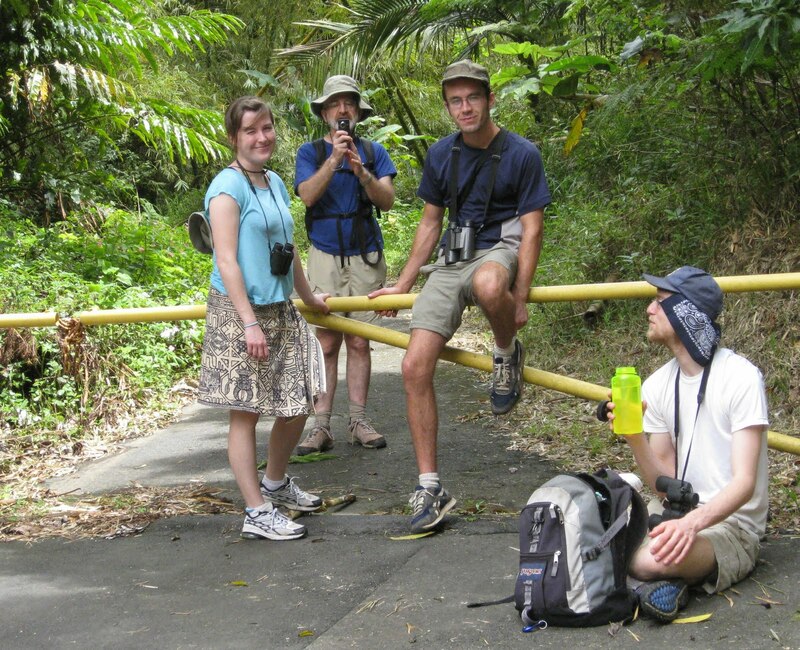 We did see a bunch of beautiful birds in El Yunque. Those included the Puerto Rican Woodpecker, the Puerto Rican Tody, the Greater Antillean Oriole, lots of Bananaquits, and the Puerto Rican Emerald (a hummingbird). Seems like a lot of the birds there have names that start with the words "Puerto Rican." 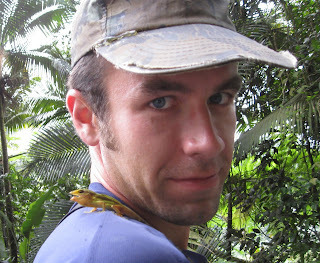 The animals we saw most often were lizards, and they were so much fun, like this one on Alan's shoulder (below). They looked like the genus Anolis, but I'm not sure. The lizards were literally everywhere - in buildings, on the road, on every tree. Why are they so common there? Are their natural predators all gone? Photos above and below by Sally Kneidel. As much as I like the lizards, the snails were really cool too. And abundant. El Yunque has 34 different species of land snails, some of them startlingly beautiful. Below, another shot of Caracolus caracolla. Photo by Sally Kneidel. We were lucky to see a walking stick, an herbivorous insect that hides from predators by resembling a twig. Below, the walking stick on Alan's shirt. Photo by Sally Kneidel. And on my head. (Photo by some Kneidel). 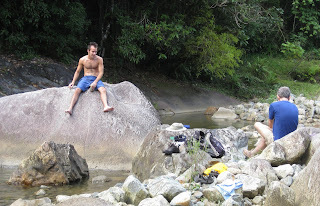 We found a great swimming hole in the river below Casa Cubuy Lodge. We stopped at almost every opportunity for a swim. Above, Matt's usually the first one in. Wish we could've stayed longer in El Yunque. But after only two nights we jammed in our rental car and headed down to the coast for a swim, before climbing back into the mountains - this time to the high peaks of the Cordillera Central. Descriptions of the beaches and the Cordillera Central to come in my next two posts. Suzanne Van Atten. Puerto Rico. Moon Handbook. September 2009. Fauna of Puerto Rico. Wikipedia. 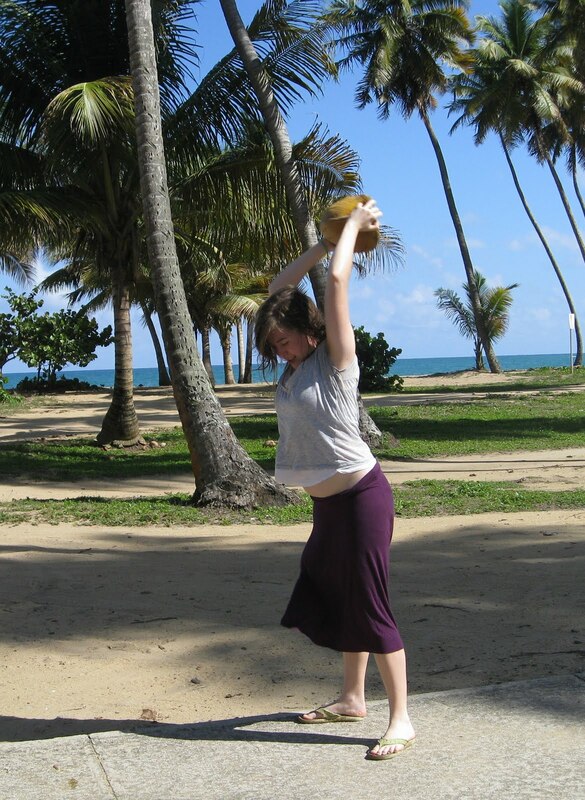 I went to Puerto Rico in March 2010 with my family, to visit my son Alan. Alan is temporarily living in Puerto Rico, doing bird research for NC State. He and his team are studying the use of natural corridors by birds nesting in forest fragments. 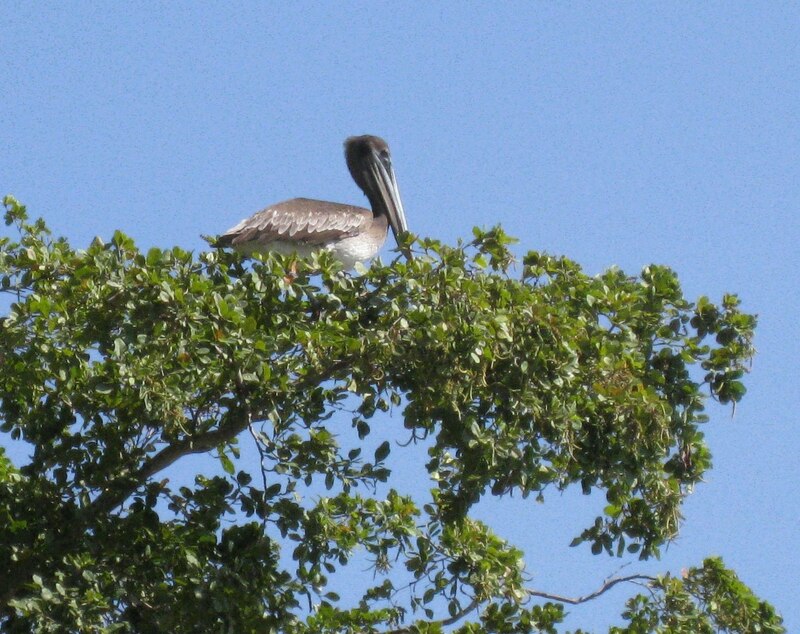 This Puerto Rican research has broad implications for all fragmented bird habitat. Many of the world's forests persist only in fragments now, due to human activities such as logging, agriculture, and development. Alan is studying whether the breeding birds of Puerto Rico must have forested corridors in order to move from forest fragment to forest fragment to search for mates or food. The team is also investigating which migratory bird species pass through Puerto Rico on their way to North America from wintering grounds in Latin America. Since Puerto Rico was colonized by the Spanish in the 1500s, almost everyone speaks Spanish as their first language. I've read that the people of P.R. are varying blends of Spanish, indigenous Taino, and Africans brought in by the Spanish. Alan says that in his home area of Guanica, on the SW coast of P.R., many of the locals are descended from Venezuelans. Puerto Rico is different from other Latin American countries I've visited in that a huge portion of the population speaks excellent English, especially in the cities. Another difference was the American infrastructure. The major highways were in excellent shape with highway signs that looked American, except the words were Spanish. And American stores were everywhere: Walmart, Walgreens, McDonalds, KFC, K-Mart, and more. Alan says you can find almost any American product, from an American store. Although he says a few things are way more expensive than in the U.S., which is typical of islands. What is Puerto Rico to the U.S.? Puerto Rico's political status is a little confusing. It's an "unincorporated territory" of the United States - belonging to the U.S. but not a part of the U.S. Federal law applies in P.R., but they have no representation in Congress. Puerto Ricans are U.S. citizens, but oddly, they can't vote in U.S. elections while in Puerto Rico. They can, however, vote if they are in the U.S. during the time of an election. Strange. I was told while I was there that the vast majority of Puerto Ricans do not want statehood. In fact, there was a 1950 revolt against the U.S. in the Puerto Rican town of Jayuya, known as the "Jayuya uprising." It led to the U.S. attacking Jayuya with bombers. My family stayed in Jayuya for three days on this trip - I'll write more about that in a later post. 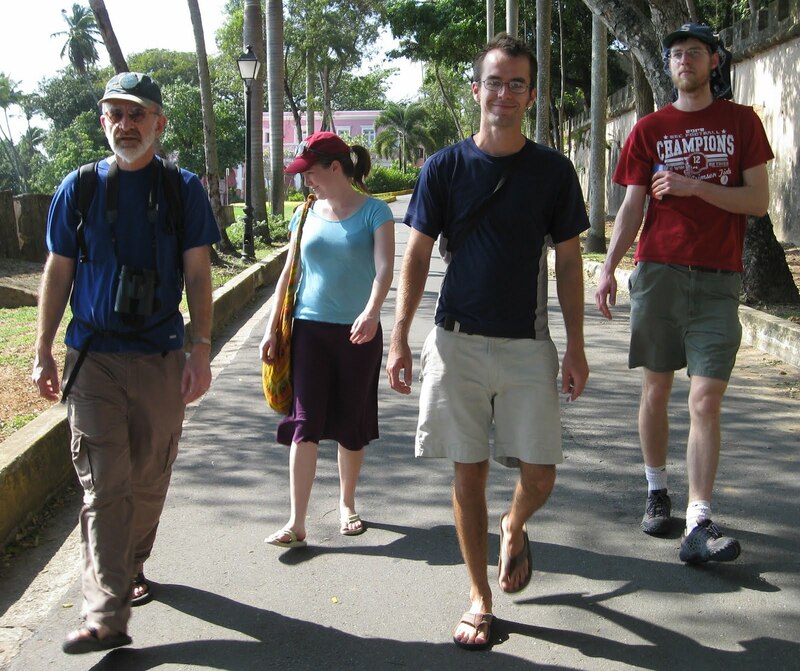 Some of the people of Jayuya were not especially welcoming of our gang of gringos from the U.S. We never did find any restaurants open, and ate dinner every night on the balcony of our hotel. The capital city of San Juan is the second-oldest European settlement in the Americas. It was founded by the Spanish in 1581, and still has two huge fortresses built by the Spanish. The ocean is almost always visible from the old part of the city, with cruise ships anchored off shore. Cruise-ship passengers roam the narrow and hilly streets, past historic pastel homes and shops. Above, many of the steep streets in Old San Juan are paved with blue cobblestones, still in place from the Spanish colonists in the 1500s. Photo by Sally Kneidel. Ken and Alan wait for me on a corner in Old San Juan. Photo by Sally Kneidel. We visited one of the two Spanish fortresses (Castillo de San Felipe del Morro) built in the 1500s, then walked back through Old San Juan along a boardwalk (or sidewalk) by the ocean. That was my favorite part of the day. A Puerto Rican family resting under a very odd tree, along the ocean walkway. 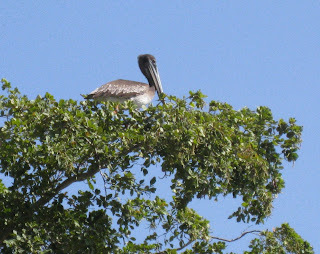 We passed a brown pelican in a tree. Photo by Sally Kneidel. The caterpillar. I have no idea what kind of butterfly or moth it was. Photo by Sally Kneidel. By 3:30 pm, we had to blast out of San Juan in our rental car to get to our next destination by sundown. We headed out for El Yunque Caribbean National Forest, a mountainous rainforest. We couldn't wait to get there. It would be cooler in the mountains, and we were eager to immerse ourselves in tropical nature. That's my next post on Puerto Rico, comin' up. Suzanne Van Atten. Puerto Rico. Moon Handbooks. September 2009. We took this book on our trip and it was helpful. We also had Lonely Planet, but I think this one was better. Puerto Rico. Wikipedia. This entry has a lot of info about what it means to be a territory of the U.S., and the connection between the U.S. and P.R. Goodbye, me (Alan Kneidel's blog). Alan has a lot of posts about life in Puerto Rico. I've seen various studies over the years about the benefits of dark chocolate, but none as convincing as this one. In an article published yesterday in the European Heart Journal, German scientists report a study that tracked nearly 20,000 people over a period of 8 years. The researchers found that people who ate approximately one square of a dark chocolate bar every day reduced their risk of both stroke and heart attack by 39%! One square is defined as 6 grams or a quarter of an ounce. This is the first study to follow people for such a long period. The researchers believe that flavonols in the chocolate are responsible for the benefits. Flavonols are also in red wine, some teas, and some vegetables. Ingestion of flavonols affects the muscles in blood vessels, helping them dilate, which causes a drop in blood pressure. Because flavonoids (a chemical group that includes flavonols) can have a bitter taste, they are often removed from chocolate, even dark chocolate. Milk, including the milk in milk chocolate, can inhibit the uptake of flavonoids and flavonols. So if you want to try taking a square of chocolate a day, look for dark chocolate that doesn't have milk in it, and don't drink a glass of milk at the same time. Some brands of dark chocolate say on the wrapper that the flavonols and flavonoids have not been removed. To read more about flavonoids and flavonol, and foods that have them, see this article. The study's lead author is Dr. Brian Buijsse, a nutritional epidemiologist at the German Institute of Human Nutrition in Nuthetal, Bermany. He and the other researchers warned that eating too much chocolate could cause weight gain, which has the opposite health effect. Weight gain is a major risk factor for strokes and heart attacks. Others around the world had similar comments about the new study. "This is not a prescription to eat more chocolate," said Dr. Robert Eckel, a professor of medicine at the University of Colorado and a past president of the American Heart Association. He was not linked to the study. "If we all had (a small amount) of chocolate every day for the rest of our lives, we would all gain a few pounds." The authors also stopped short of recommending that everyone eat chocolate every day. "It's a bit early to come up with recommendations that people should eat more chocolate, but if people replace sugar or high-fat snacks with a little piece of dark chocolate, that might help," said Dr. Buijsse. The authors, and others, feel that more research is needed to determine the exact impact of chocolate on the body. The study was funded by the German government and the European Union. "Easter eggs crack heart risks." German Herald. April 1, 2010. Maria Cheng, AP Medical Writer. "Study: Chocolate could reduce heart risk." Charlotte Observer. April 1, 2010. A similar story by Maria Cheng is available online: "Study: Chocolate could reduce heart risk." Lubbock Online. March 31, 2010. Flavonoid. Wikipedia. April 1, 2010.